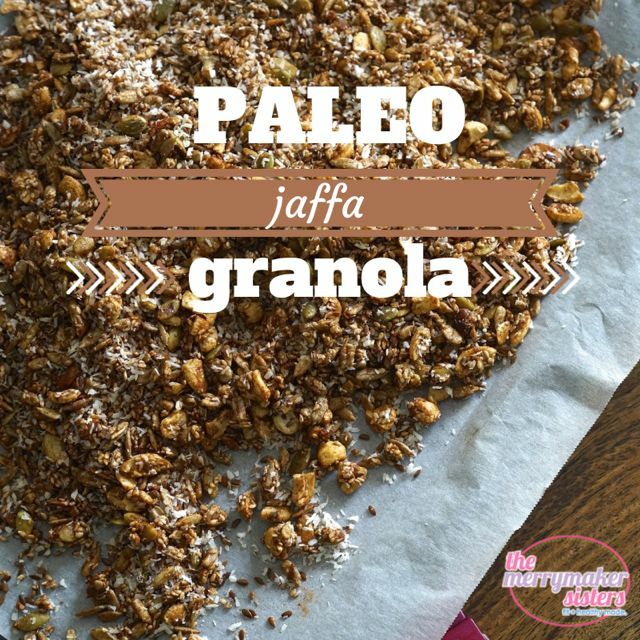 Paleo jaffa granola is seriously delicious! We never really liked jaffas when we were little and now we don’t eat any of the ‘traditional’ lollies and candy (YAY!). We make our own jelly lollies and they are scrummy yummy. Anyway, the point is that orange + chocolate = amazing paleo granola! We hope you like the jaffa granola and we’d love love love to see a picture of your brekky. Share pics on social media and use #themerrymakersisters. 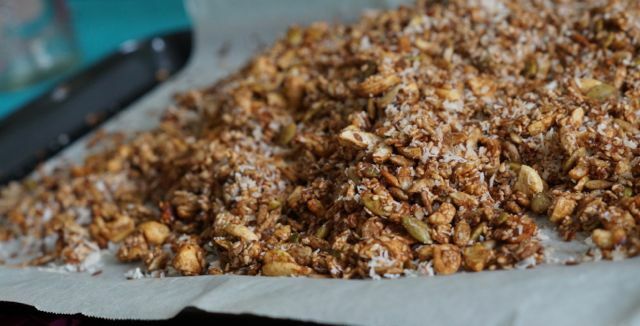 If you are after more granola paleo recipes click here. Mix the cashews, sesame seeds, sunflower seeds, linseeds, pumpkin seeds, Natvia, raw cacao powder and orange rind. Melt the coconut oil and pour over the dry mix. Spread the mix evenly on the baking tray and place into the oven for 8 minutes (give it a stir at 4 minutes). Once cooked allow to cool and then stir through the shredded coconut. We serve ours with almond milk (learn how to make your own here! ).